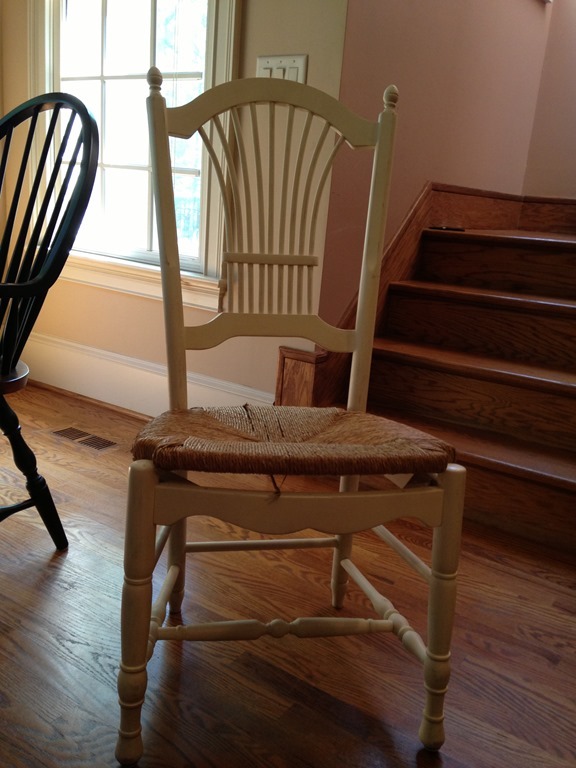 I am no upholstery wiz. I leave the big stuff to the professionals. 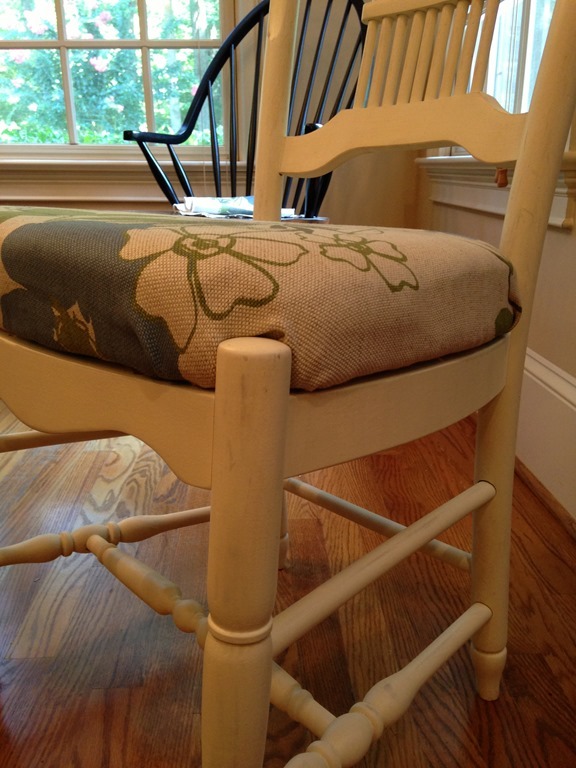 But no-sew little seat cushions, no problem. I showed you my neighbors new/old breakfast area dining set here. Now, here is how we covered those seats. My neighbor had done her homework and bought 2 inch foam padding for the seats and cut them to size. 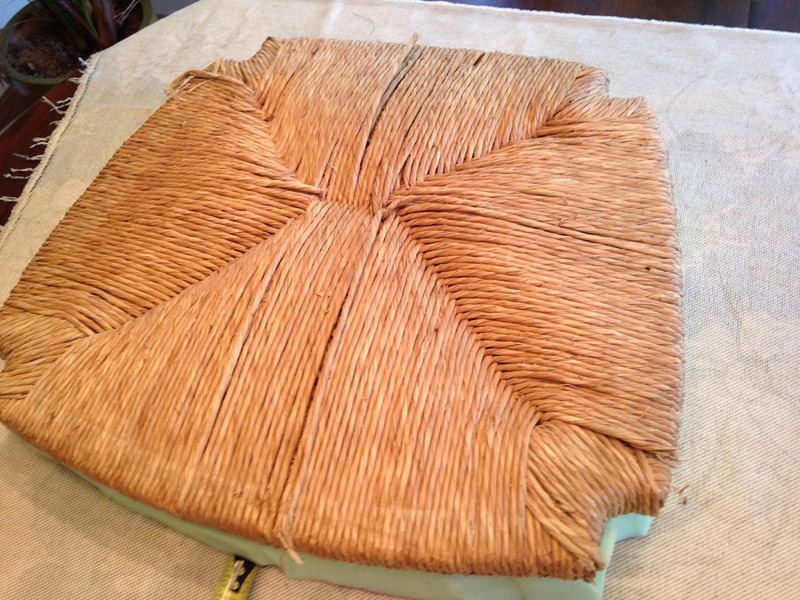 We glued the foam to the old woven seats. 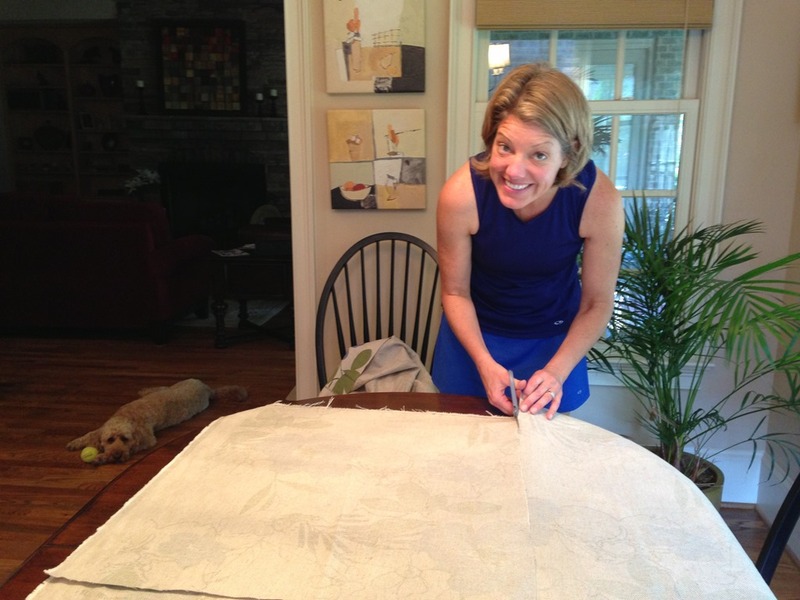 Then we laid out the fabric and measured. 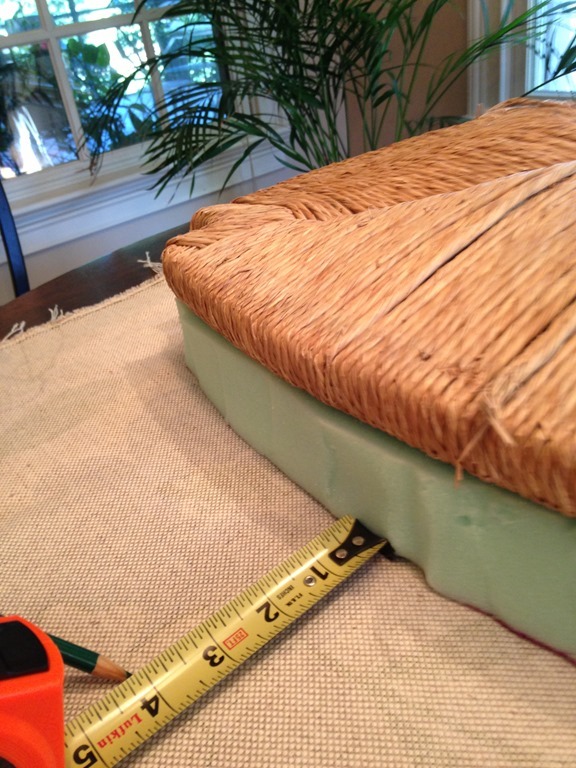 With the 2 inches of foam, the 1 inch of the original seat and at least an inch to staple, we needed to cut our squares with an additional 4 inches on each side of the seat. I am an advocate of measuring twice and cutting once! I am also an advocate of cutting squares, not cutting to the shape of the object being covered. Why, you ask? 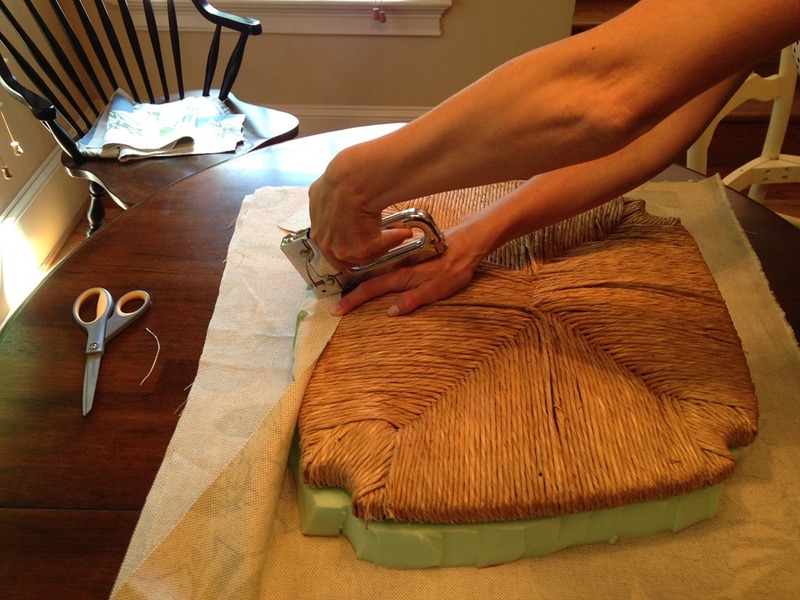 Because you can always trim excess fabric but you can’t put it back on! That’s my neighbor, cutting away! 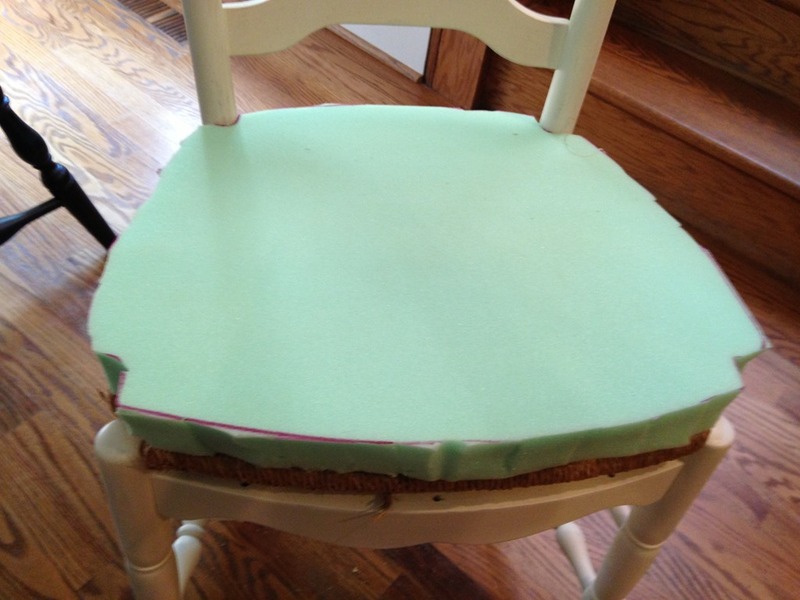 Now, you lay the seat with the foam on top, foam side down, and pull up one side of the fabric. Then you staple it into place. 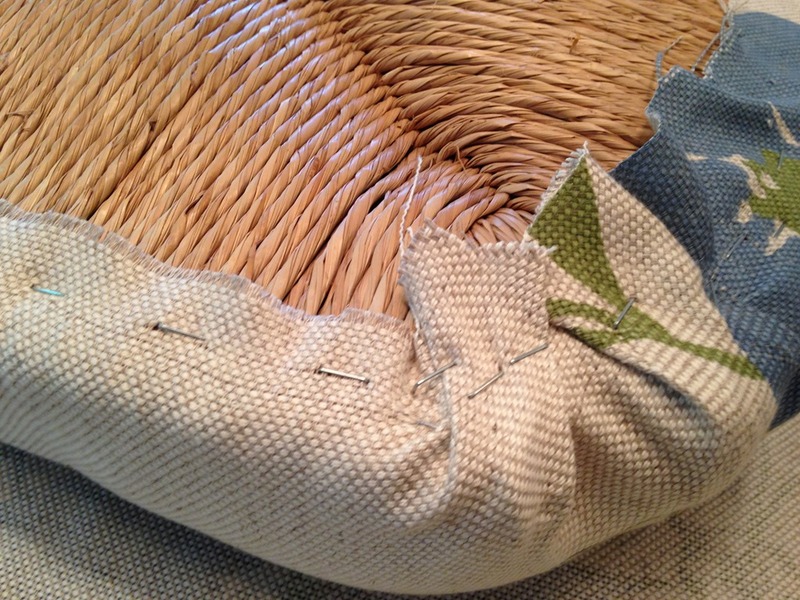 Then you pull the fabric from the opposite side nice and tight and staple into place. 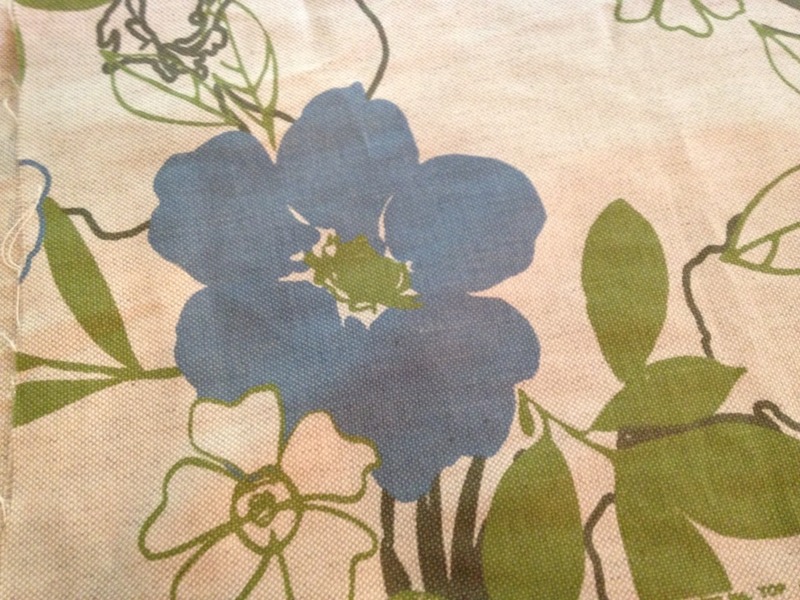 I do opposite sides so that the fabric gets pulled very tight and looks nice and smooth. 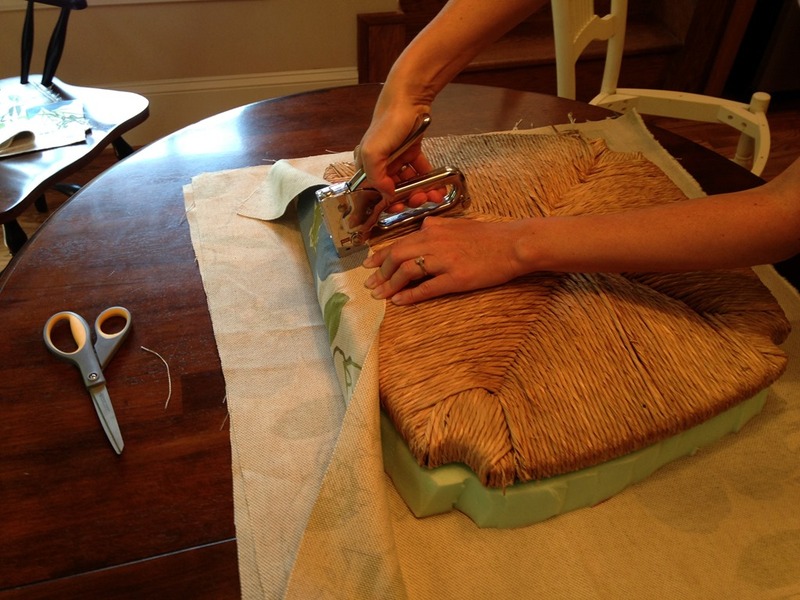 Keep the staples close together so that the fabric stays stretched. 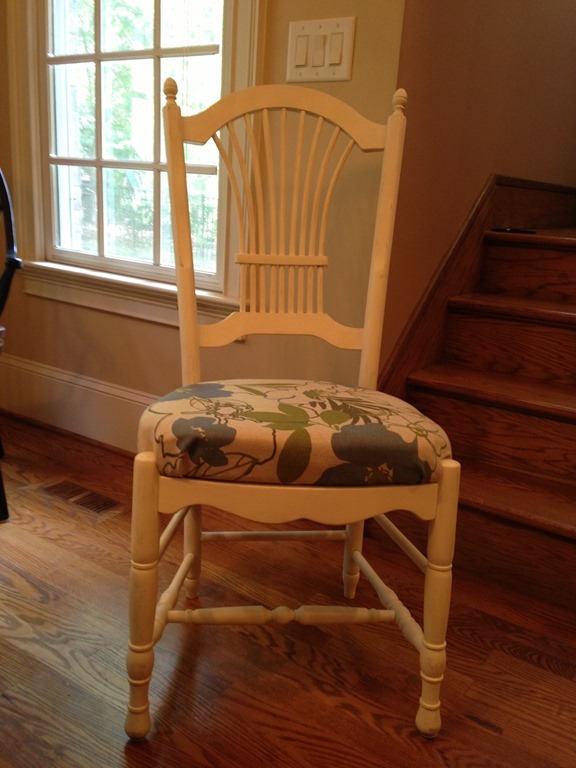 You can replace the cushions on the chair frames and voila! It’s just like new! A couple of weeks ago, one of my fantastic neighbors asked if I would go fabric shopping with her. Um, YES! 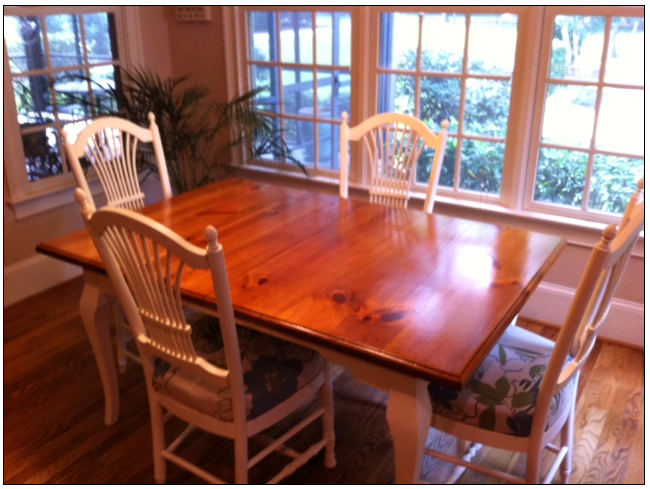 She had inherited a dining set from some neighbors that were moving and she wanted to refinish it and put some cloth on the seats. She read my blog and knew I loved decorating. She wanted my advice on what direction to go in. Her family all felt that it was time to brighten up their house with lighter finishes. The new dining set was off white with a wood top. My neighbor had been working very hard on stripping the top and repainting the legs and chairs. She did a great job!!! So, before we went shopping I asked her some questions about colors. She said her favorite colors were magenta and indigo. My first thought was that we were headed down a purple path. Now, my neighbor has a husband and a son so I was guessing a “girly” purple wouldn’t work for them. 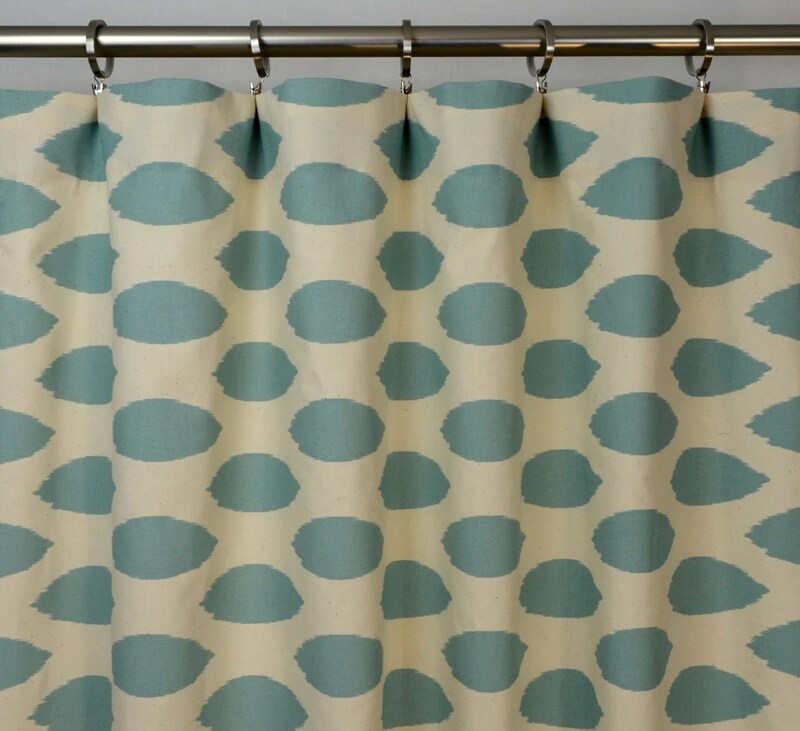 As we headed to the fabric store (her awesome daughter was with us too) I just figured we would be looking for a muted purple with some earthy brown or gold and cream just to keep it masculine AND feminine. I was WRONG! When I am assisting someone with their décor choices, I don’t like to run the show. It is their house, not mine. They have to live there and be happy. I’m just there to tell them if it is ugly and what would go well with their choices. I’m more of a color consultant, if you will. Beautiful! That was the one! There was no hesitation and no question about it. This was the direction to go in. I thought they would really complete the space. It is still a work in progress because all good things take time, but the hard part is done. A color scheme has been chosen and a beautiful refinish has been done. Don’t you love a happy ending?